NIIGATA (TR) – Following criticism over the handling of the alleged assault of Maho Yamaguchi, a popular member of idol unit NGT48, the group’s agency on Monday announced the termination of a manager, reports TV Asahi (Jan. 14). 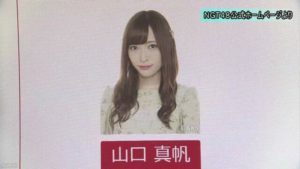 At a press conference, Takumi Matsumura, a representative of agency AKS, offered an apology and said that Etsuro Imamura, the manager of NGT48’s theater in Niigata City, had been replaced with Maiko Hayakawa, who is also a representative of AKS. The move follows the emergence of an assault incident that targeted the 23-year-old Yamaguchi. 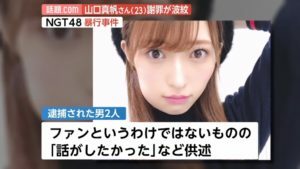 In a series of tweets on January 9, the idol said that two men grabbed her by the face and shoved her down as tried to close the front door of her residence in Niigata City after she returned home alone from a show on December 8. According to police, the men, both 25, were accused of assault after the incident. During questioning, the pair denied the charges, saying they merely wanted to speak with Yamaguchi. “I hold a fondness for her,” one of them was quoted. They were released on December 29. Also on January 10, Yamaguchi apologized at a performance for “causing concern” as a result of the incident. The following day, AKS announced the cancellation of three NGT48 appearances. The handling of the incident received widespread criticism online. On Twitter, Rino Sashihara of HKT48, another sister group of AKB48, slammed AKS, saying that it was ridiculous that Yamaguchi should apologize while the agency remained silent. During the press conference on Monday, Matsumura declined to explain exactly what transpired during the alleged assault of Yamaguchi. He said the agency waited until Monday to appear in public in taking into account the police investigation.